Marginal effects measure the expected instantaneous change in the dependent variable as a function of a change in a certain explanatory variable while keeping all the other covariates constant. The marginal effect measurement is required to interpret the effect of the regressors on the dependent variable. This example illustrates the calculation of marginal effects by using the QLIM procedure in binary choice models and censored models. The first data are the binary choice (0–1) data set used by Spector and Mazzeo (1980) to study the effectiveness of a new method in teaching Economics. The data are read by the following DATA step statements. where is the density function that corresponds to the cumulative function . The marginal effects are nonlinear functions of the parameter estimates and levels of the explanatory variables. Hence, they generally cannot be inferred directly from parameter estimates. Marginal effects for distributions such as probit and logit can be computed with PROC QLIM by using the MARGINAL option in the OUTPUT statement. The following MODEL statement fits the model equation to the endogenous variable GRADE and the covariates GPA, TUCE, and PSI. Further, you can specify the discrete nature of the endogenous variable by using the DISCRETE option. The D=PROBIT option in the MODEL statement enables you to specify the probit distribution. In the OUTPUT statement, use the OUT = option coupled with the MARGINAL option to obtain the marginal effects in the data set. The following output in Figure 2.1 displays the probit model fit statistics. The MARGINAL option in PROC QLIM evaluates marginal effects for each observation. In the output data set, OUTME, 'Meff_P2_covariate' and 'Meff_P1_covariate' refer to the marginal effect of 'covariate' on the probability of GRADE=1 and on the probability of GRADE=0, respectively. Hence, 'Meff_P2_gpa' is the marginal effect of GPA on the probability of GRADE=1. 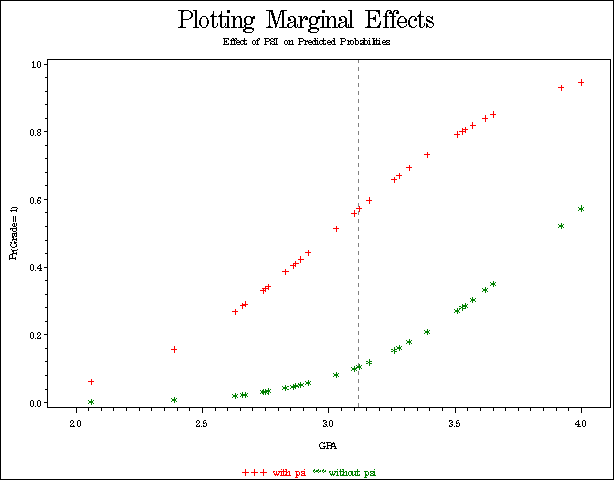 Figure 2.2 shows the overall marginal effects of PSI, TUCE, and GPA for the probit model fit. Marginal effects at sample means of covariates can be obtained by adding an observation with a missing value for GRADE (endogenous variable) and the sample means of the covariates to the original dataset GREENEDATA. The following DATA step statements add the observation to the original dataset where means of GPA, TUCE, and PSI are 3.117, 21.938, and 0.4375, respectively. Because of the missing value of GRADE, model fitting does not depend on this observation. However, marginal effects and predicted probability values are obtained. The PROBALL option in the OUTPUT statement enables you to obtain the predicted probabilities of discrete endogenous variables for all responses. In order to obtain the previously described difference (when the other covariates are fixed at their means), you can append two observations with 1 and 0 as the discrete regressor’s (PSI) value, means of the other covariates, and missing values for the response variable as shown. The table obtained by using the PROBALL option in PROC QLIM produces two columns labeled 'Prob2_grade' and 'Prob1_grade' which are and respectively. You can obtain the predicted probabilities required for the above computation of marginal effects from the last two observations in column 'Prob2_grade'. As shown in Figure 2.4 , you can compute the marginal effect of PSI to be ( ). Hence, the overall effect of a unit change in PSI (by introducing the new teaching method with an exposure to PSI), on the probability of GRADE=1 (an increase in the student’s grade) is . Note that although for discrete covariates the difference calculation is usually employed to obtain marginal effects, in this example you can observe that both the derivative (Meff_P2_psi= , from Figure 2.3) and difference calculations ( , by taking the difference of probabilities under 'Prob2_grade' from Figure 2.4) produce similar results. However, this might not be true for other data sets. The marginal effects plot with respect to PSI on the is shown in Figure 2.5 using results from the probit model fit. The marginal effects of PSI on are obtained as a function of the GPA, at the mean of TUCE. This allows better interpretation of results. As shown in Figure 2.5, you can conclude that the effect of PSI is much greater on those students who have a higher GPA. Similar analysis with ordered multinomial, censored, and truncated data are supported by the QLIM procedure. An example with censored data is illustrated below. The following DATA step statements are used to read the data. In this example, a tobit model is estimated. You can fit a logit or a probit model to the dummy response variable LFP, similar to the analysis shown earlier. You can append the MROZ data set with the mean values of the explanatory variables as shown in the following statements. Figure 2.6 shows the marginal effect results for a tobit model fit. Similar analysis using the probit and logit models yield results shown in Figure 2.7 and Figure 2.8 respectively. Greene, W. H. (1997), Econometric Analysis, Third edition, Prentice Hall, 339–350. Mroz, T.A. (1987), "The Sensitivity of an Empirical Model of Married Women’s Hours of Work to Economic and Statistical Assumptions," Econometrica, 55, 765–799. Spector, L. and Mazzeo, M. (1980), "Probit Analysis and Economic Education," Journal of Economic Education, 11, 37–44. SAS Institute Inc. (2008), SAS/ETS User’s Guide, Version 9.2, Cary, NC: SAS Institute Inc.